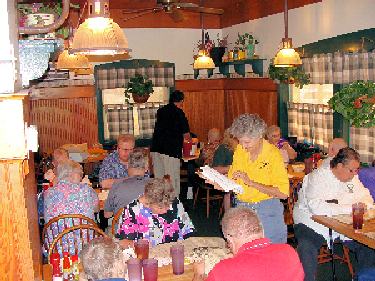 On March 23rd we got together to celebrate our 85th Anniversary at Denny's Restaurant. 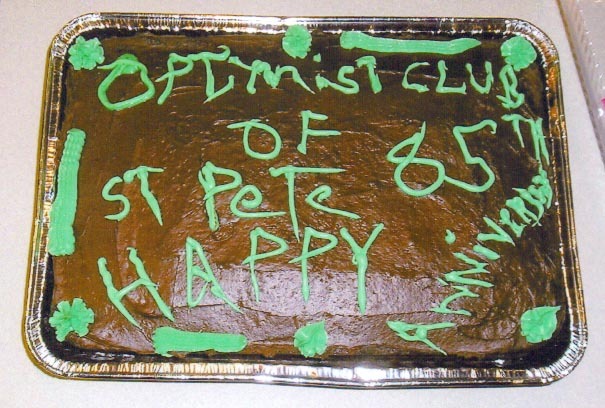 Dave, our waiter was nice enough to make us a cake to help us celebrate. Members from other clubs came out to help us with this special occasion. Making Pizza's at Tropicana Field (Tampa Bay Ray's Stadium) for Papa John's Pizza enables us to earn money so we can give to the kids and our community. 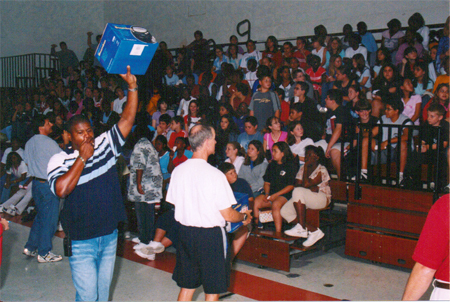 School with the Bucks Program. school to purchase the items. 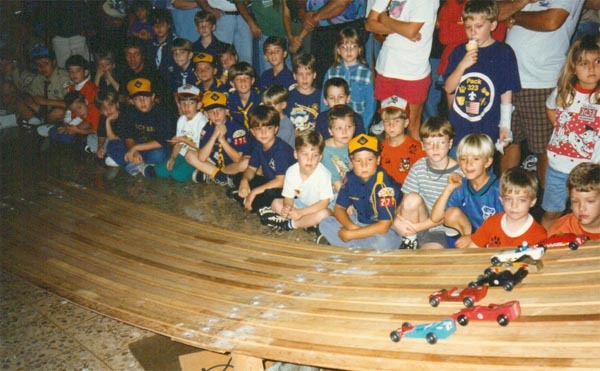 Don Stillwagon and Arthur Bourgeois checking in a Pinewood Derby entrant. 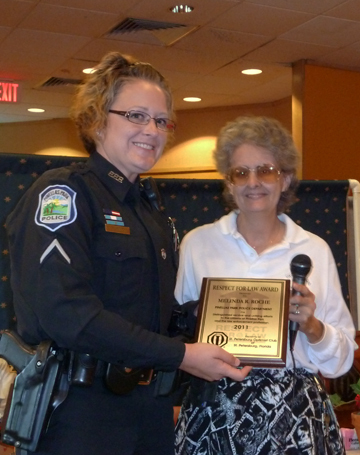 Melinda Roche - Pinellas Park Police Dept was our Respect for Law honoree. 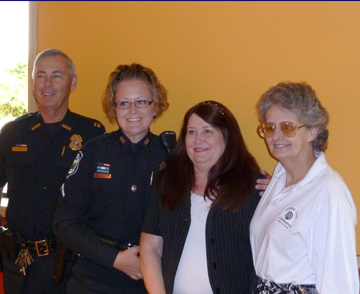 Melinda with her Captain, Mother and Sue after receiving her plaque. 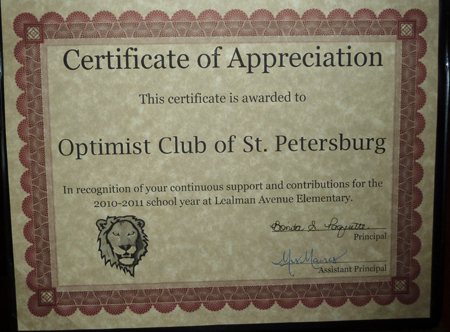 Received from Lealman Elementary School for our continuous support and contributions. 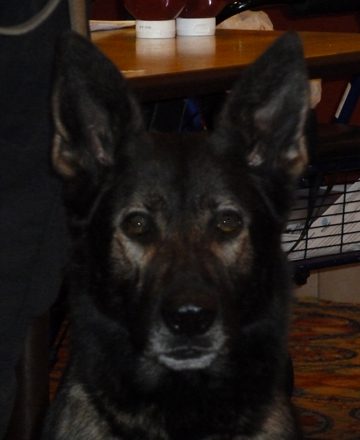 Kentucky - K9 dog was there too! 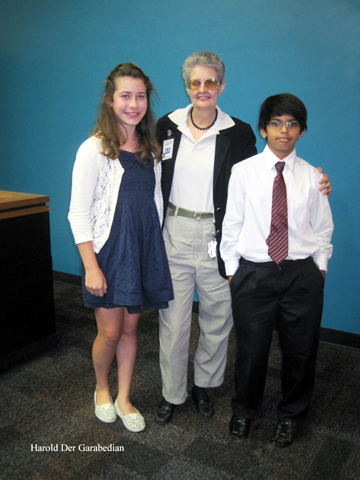 Terry with our two winners at the school Oratorical Contest. 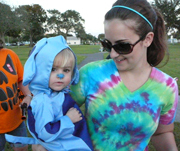 Giving out the candy to all kids of all ages - it was fun! 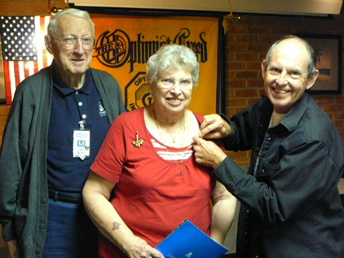 Terry Pendleton pinning Nora with her husband Edgar who is our Secretary, Treasurer along side her to welcome our newest member and long time friend to our meetings and projects. 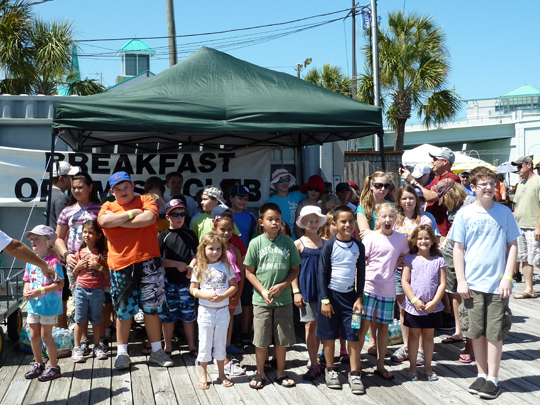 April 15, 2012 - Breakfast Club Sponsored a Fish-A-Thon for the kids - our club had 3 kids come out and participate. 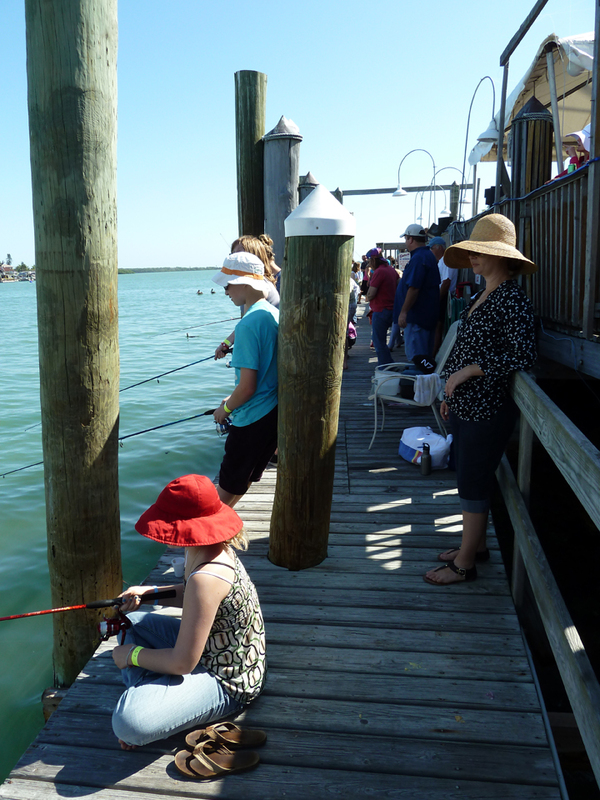 Somer and her 3 kids reeled in many fish and got to keep their new fishing rods and reels. A party for the volunteers and to get ready for the new season. 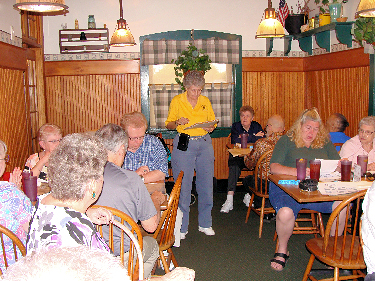 Thanks to all our volunteers we had a great year. 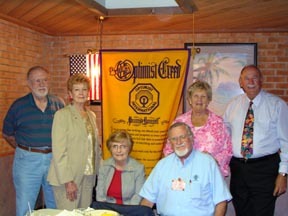 Our 2012 Oritorical Contest Winners - they did it again for our club. Scott Kaplan, No FL District Governor and volunteer for us at the Tropiciana "Rays" joined us for our dinner thanking all of the volunteers. Volunteers helping us give back to the community. 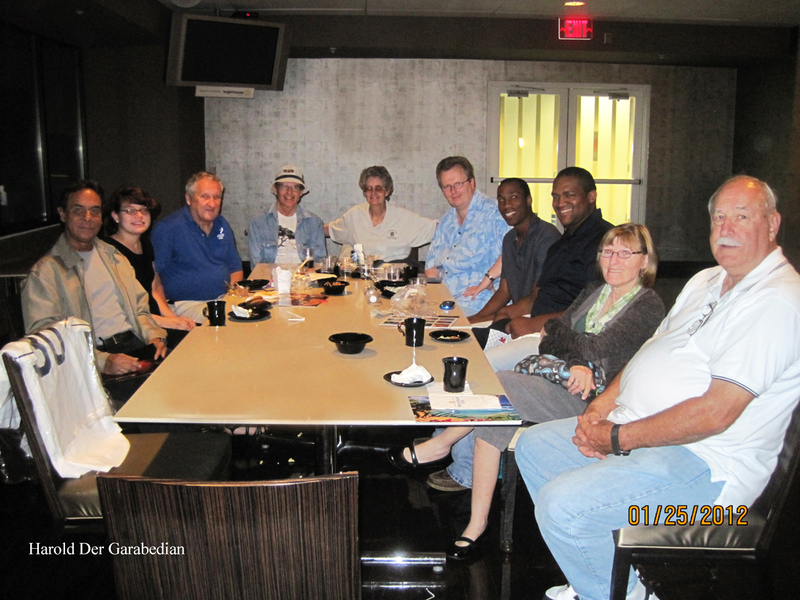 We thanked them with a dinner and an fun outting. This was our 6th year of donating to Mason Dixon's Christmas Wish Fund. Our member Nancy Berghammer hand delivered the check and was on the air with Mason giving thanks to all of the volunteers who helped us throughout the Ray's season. Mason knows that the money is to be given to a family with kids. 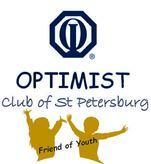 Remember that is what we are all about; "Friend of Youth!" and giving back to the community. 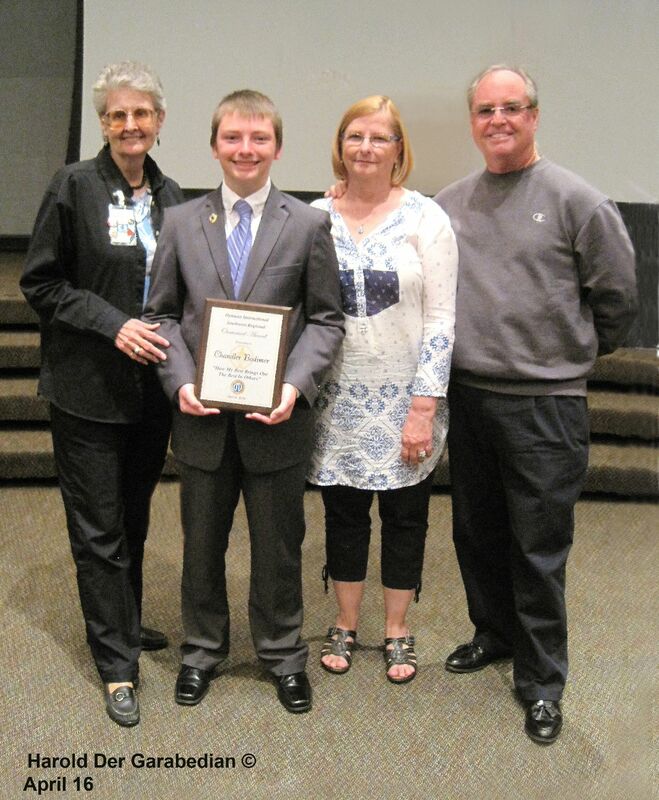 Mason Dixon accepting our donation at Q105 delivered by Nancy Berghammer, member. Our club members where joined with Gov Scott Kaplan, Lt Gov Linda and David D, George K, Kathy S, Vi and Chuck H, Jean R, Lee and wife. We were honored to say the least. It was great a night for us all. 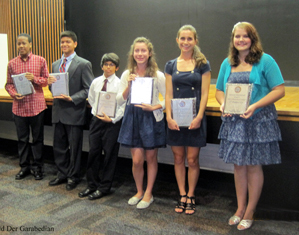 Brooke and Joey participated in the Morgan Fitzgerald Oratorical Contest and went on the next level. They are both winners in our books. Both of them spoke rather well and presented themselves with much grace. We are proud of them. In an all out effort to help stop bullying our chapter set up a booth. We wanted to get the word across to the parents and children that bullying hurts everyone involved. Terry was very much involved in this event and our thank you goes out to him for all his efforts. 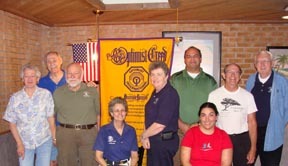 We just celebrated our 90th Anniversary and the turnout from the other clubs was great. We received gifts from clubs and an Award from OI presented by our new Governor. What a night to remember. 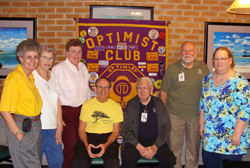 Our club celebrated our 91st Anniversary and had the pleasure of having Vi and Chuck Hayworth as guests. They surprised us be advising that they were donating to OI in our name, it was greatly appreciated by our group. We all had a great time and the cake was enjoyed by all. 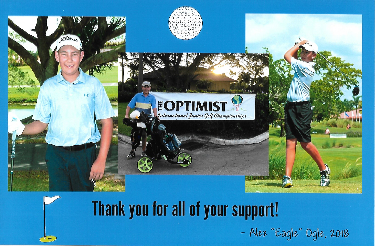 This was our 8th year of donating to Mason Dixon's Christmas Wish Fund. Our members Nancy Berghammer and Sue Lewis hand delivered the check and was on the air with Mason giving thanks to all of the volunteers who helped us throughout the Ray's season. The money went to a needy family with kids. 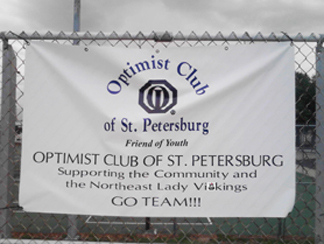 Remember that is what we are all about; "Friend of Youth!" and giving back to the community. 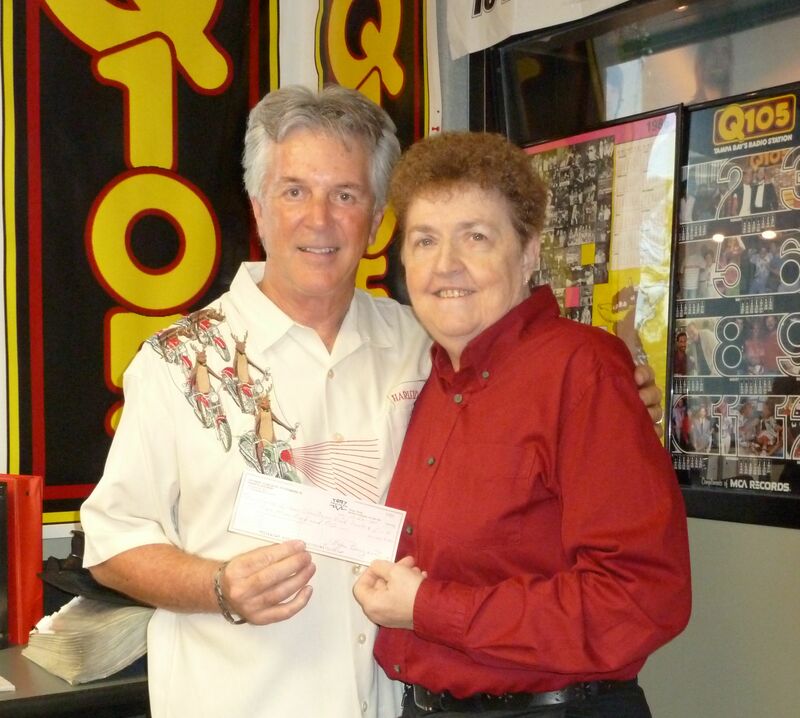 Mason Dixon accepted our donation at Q105 . We are so proud of our two 1st Place winners, Jessica Silk and Harry Potter and they are going to participate in this years too. These are two great young adults. 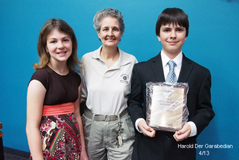 Our club President, Terry Pendleton and Vice President, Sue Lewis went to Hayden's graduation ceremony from St Petersburg College. Hayden is the youngest member of our club. 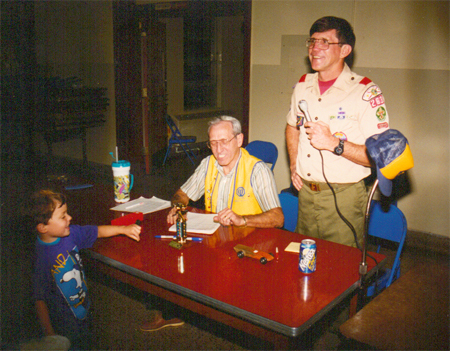 He volunteers at the Tropiciana Ray games to help us give back to the community for kids. 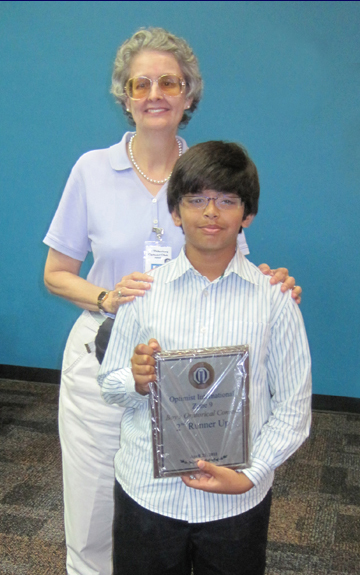 He is a great member and he is going to pursue further education. Our club is growing. On January 11th, 2016 we had the induction of our two newest members Mary Cones and Janate Moultrie at Denny's Restuarant. Our club had the honor of recognizing Angelica Nguyen on February 24th at Olive Garden for Youth Appreciation. 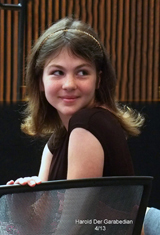 Angelica is quite a talented and energetic young lady. 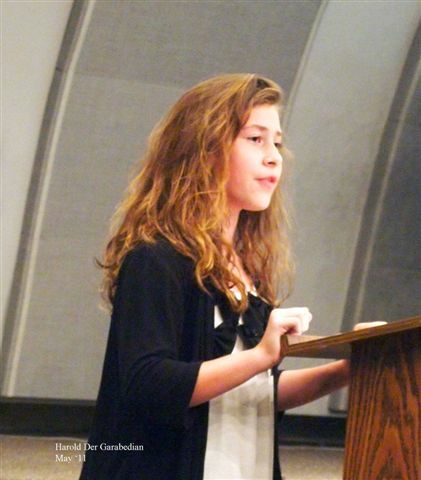 She is graduating from high school in June with a 4.4 grade average. She took college classes and also applied to several colleges and was accepted by all of them, she picked USF. 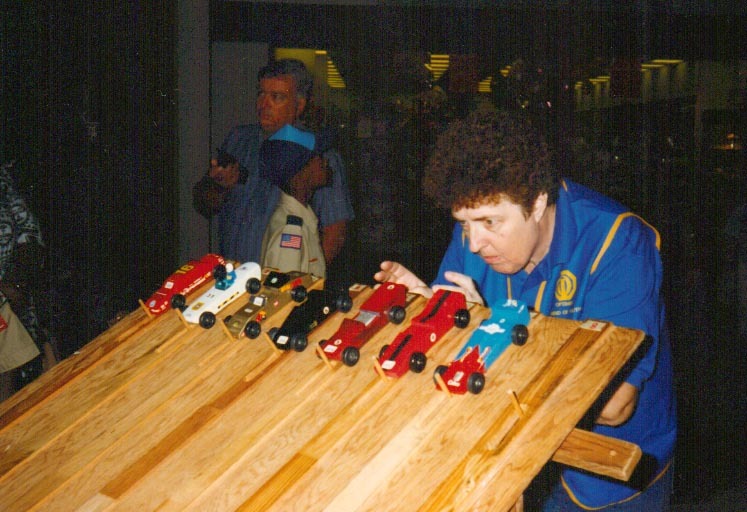 Angelica helps us out at the Tropiciana for the Ray's games and we can always count on her to be there. She works and was just promoted to a leader position. Angelica also teaches algebra twice a week to other kids. She is definitely an inspiration to others. 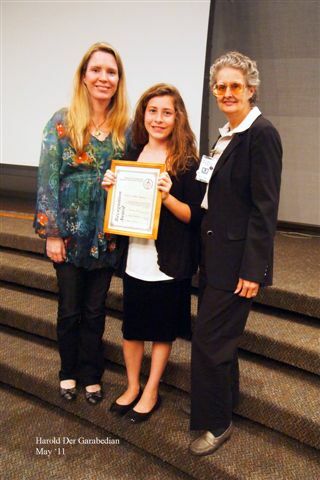 We are proud to honor this individual for her work in the community. 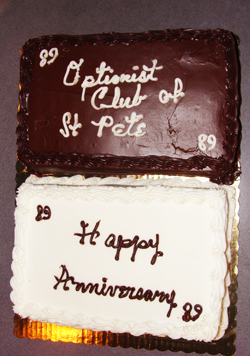 Our members got together at Po Folks to celebrate our 92nd Anniversary of our Club which was started in 1924. 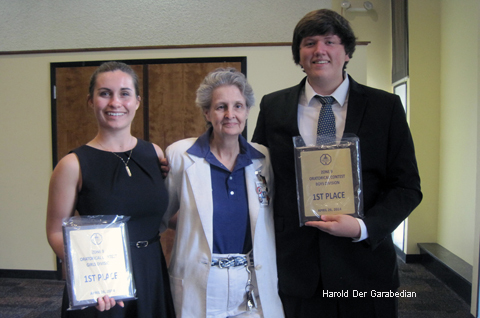 April 9th was a great day for Chandler Bodimer in the Oratorical Contest this last Saturday. He did a great job in his presentation and will be going to the next level. 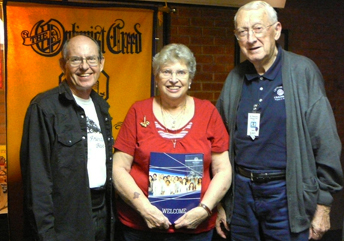 Sue Lewis and Harold Der Garabedian (a FOO member) were there at the presentation. Chandler stood out among the participants. We wish him only the best. We were extremely proud to honor two dedicated gentlemen who do outstanding work and contribute to the community through the Pinellas Sheriff's Police Athletic League (PAL). 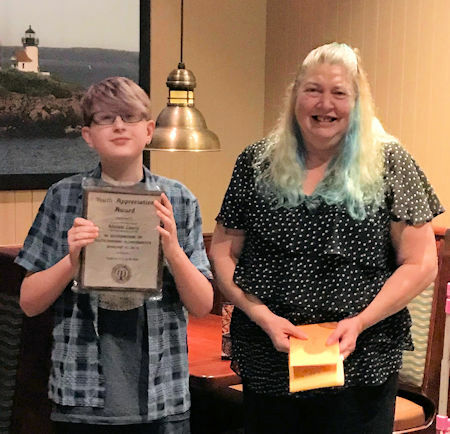 Kim Worthy had the pleasure of presenting the plaques to Joshua Bosse a Coach who was really surprised as it was kept a secret from him and Neil Brickfield, his Supervisor was also surprised too, because he had no idea that we were honoring him too. It was a great evening. 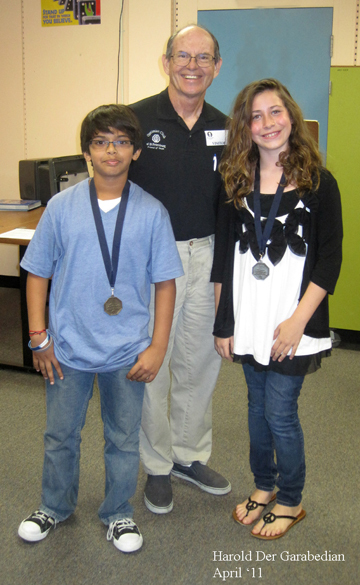 This year's participants Emma Temarkin and Parvin Sembu did a great job at only 11 years old. 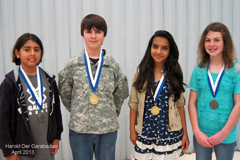 Emma went on to be one of the 6 finalist in the District contest. 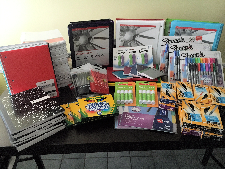 A shopping we did go, a shopping we did go - School starting up it was time to get some supplies for the kids that needed them. Also included in the purchase was two USB 8gb flash drives for each school to give to the teachers. Chandler did it this time and we are proud of him. This was his last chance to win because of age. He has compete in this for several years and got better each time. This was his year to win and he did it! 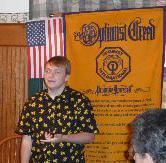 Chandler giving speech at our meeting. 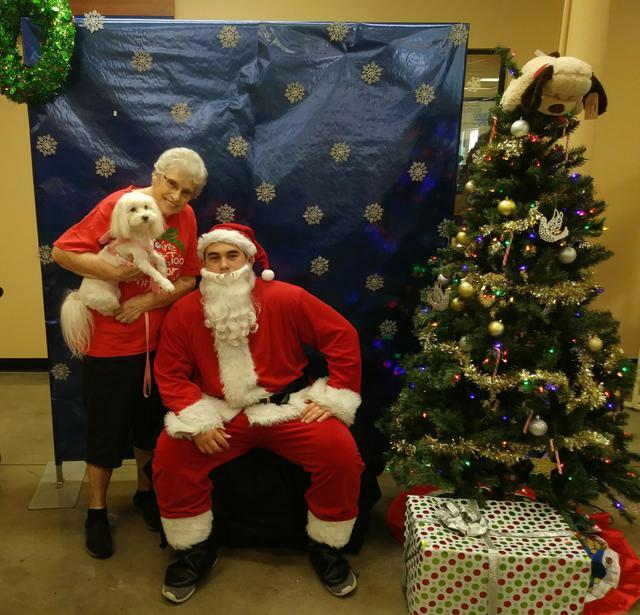 Member Nora Bourgeois and little Jeanie visiting Santa Claus at Pet Smart for Christmas. A great way to celebrate for both of them. 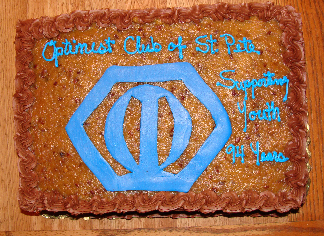 We were honored to have the Optimist Clubs come out to help us celebrate our 94th Anniversary on Monday, March 26th. 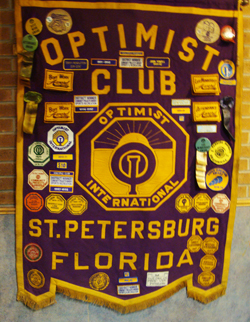 Especially since our club is the oldest in the Southeast United States. The room was full, the cake was delicious and the guests were great. What more could we ask for? Nothing could beat it! The winner of the District Golf Outing was invited to play in the PGA Tournament in West Palm Beach. This is a special event and one that a young man would be proud to attend and participate in. The event is expensive and we wanted the winner to be able to take part in it. The clubs got together and donated funds for this to take place. Alex played against 75 young players in this tournament and came in 9th. This was quite an accomplishment for him. He stated he needs to work on this chipping. Look out Tiger Woods you have a competitor out there in the wings. We had the privilege of honoring a youth man who is only 13 years old. He has been helping our club over the last 3 to 4 years with the different projects we have put on. He always volunteered to help and never asked for anything. 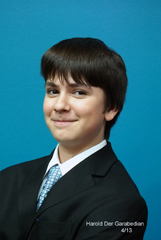 Malaki has a great talent and inventive mind. He likes to make games for others to play. He did that for our Spaghetti Dinner and the other clubs have used it too. Way to go Malaki, keep up volunteering.